Ten years ago, social media and text messaging were new sources for day-to-day digital communication. Today, an increasing number of us are using messenger apps like WhatsApp, Facebook Messenger, and WeChat to stay connected with friends and family. While this shift has been gradual in the United States, it has been much faster in other regions, including Asia and Europe. Just how popular have these apps become? WhatsApp is used by nearly one in seven people worldwide. Usage of Facebook Messenger and WeChat also continues to grow exponentially. Although many of us are now more likely to communicate on a messaging app than via email, the majority of companies still use email as their primary digital customer support channel. Yet, some pioneering customer service organizations, particularly in the telecom, hospitality, and ecommerce industries, are beginning to see valuable opportunities to leverage messaging apps to improve their customer experience (CX). This is why Forrester Research recently named messaging as one of their five technologies transforming customer care in their report Plan Now for Customer Service in 2021. It’s also the reason many CX experts believe that messaging apps are poised to be a breakthrough communication channel for companies across all industries that want to stay competitive. From the customer’s perspective, a primary advantage of using a messaging app for obtaining service is convenience. When a customer has an issue, they want a quick, efficient response. It can be time-consuming to send an email to a service center and wait for an answer. With a messaging app, the customer can connect with a company directly from an app they are already using. A response is immediate. This provides the customer with a sense of both familiarity and control. Along with streamlining the experience, messaging apps also offer companies new ways to engage with and sell to customers. Because messaging app users only let in the people and companies they know, stronger relationships can be developed. This opens up more personalized promotional, cross-selling, and upselling opportunities along with a higher level of privacy that traditional social media doesn’t offer. Another advantage that messaging delivers is the ability to embed channels and functions. For example, a virtual assistant that generates answers from both a knowledge base and contextual data can be embedded into a messaging app to provide a highly efficient and convenient self-service channel. Unlike phone calls and emails that have clear beginnings and endings, interactions that take place on messaging apps can happen over an extended period of time. This makes it more difficult for forecasting volume and scheduling agents, as well as for routing. With a persistent channel, an interaction may begin with one agent and then pick up several hours later with another agent. To provide consistent, seamless CX, agents, who are managing these interactions, need visibility of the entire customer journey to be able to pick up where other agents left off. This requires a customer experience platform that supports end-to-end, omnichannel journeys that happen across channels and with multiple agents. As messaging continues to grow in popularity as a communication channel, particularly with tech-savvy millennials, demand for service in messaging apps will grow. Companies that are able to incorporate messaging into their service mix and use it effectively will gain a competitive advantage over those that continue to focus on email as their primary digital channel. 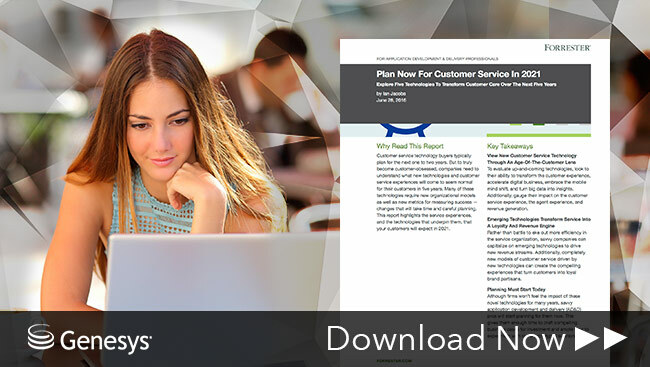 Read the full Forrester Report: Plan Now for Customer Service in 2021.